The following activities are planned and implemented in the project villages in order to achieve set objectives. The project back to farming is an on-going initiative as an investment towards reviving agriculture along with farming activities for sustainable results. Under this project various paddy fields left fallow for various reasons were identified and farmers were helped to revive farming through our collaboration with the Zonal Agriculture department involving the farming fraternity to promote traditional means of livelihood. 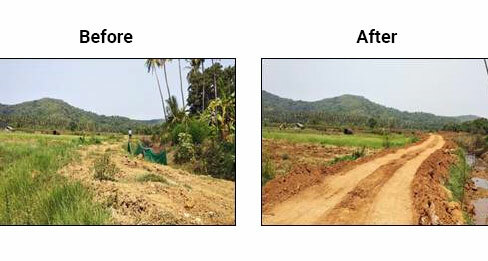 Back to farming project has been undertaken across mining belt and has been successful in 7 villages. We have motivated about 320 farmers to bring barren land into cultivation providing seeds, fertilizers, irrigation facilities, power tiller and manure for de-silting etc. and brought about 270ha of land under cultivation. For the year 2017, various initiatives were taken for agriculture development and farmers from Pilgao were provided 25 bags of fertilizers. Similarly, Alsano seeds were distributed to 41 farmers from Amona in November 2017. In order to promote and develop Dairy Farming, financial assistance for purchasing cattle feed is provided to dairy farmers. This is on the basis of need Identification, as per which, requests from the villagers are processed. Currently, 61 farmers are benefitting under the Dairy Farming Scheme. Gram Nirman – 2010 is partnership project under PPP mode wherein Mineral Foundation of Goa, Sesa Goa Ltd, Govt. of Goa and Village Panchayat Kirlapal – Dabal in South and VP Mayem – Vaiguinim in North are the partners. This project conceived in 2007 through the patronage of the Chief Secretary, Govt. of Goa. The awareness and mobilization process was long drawn to ensure that more and more people participated in this program. The committee members were requested to identify different projects and issues of public interest and also to come up with probable solutions. All the request and issues were deliberated through two rounds at each WDC meeting to prioritize the same. Under the Gram Nirman project, several projects were implemented viz. A key project under Gram Nirman was creation of drinking water facility in the village benefitting entire village of Kirlapal Dabal. It involved construction of overhead tank of 3 lakh ltr capacity, filtration unit and water pipeline. Gram Nirman has benefitted approximately 13000 populations with 17 Hamlets in two village panchayat.